Abstract: Roses are one of the most traded and consumed commodities in the worldwide horticulture sector. In 2016 the turnover of cut roses at the Dutch horticulture auction house Royal FloraHolland amounted up to e 746 million. Although cut roses are highly perishable products, they are often transported over long distances from growers in tropical areas (e.g., Kenya) to Europe or America. Therefore, the preservation of the quality of cut roses is always a challenge for importers and traders. Inefficiencies in cooling facilities or logistics activities can cause quality deterioration, which leads to spoilage or customer dissatisfaction. One particular challenge is that future demand from end customers is often unknown, which adds even more uncertainty to the supply chain. 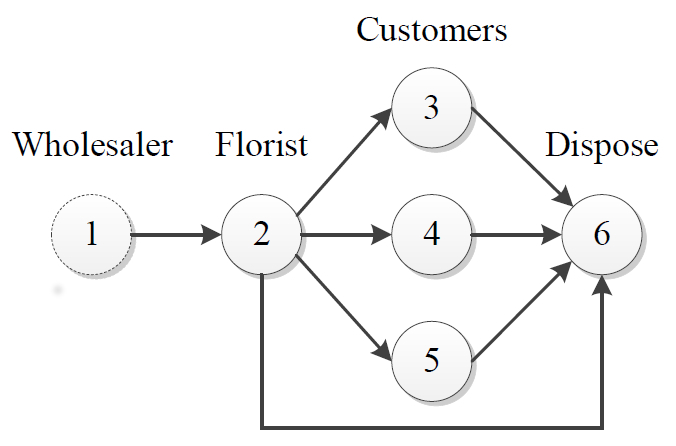 In this study, we consider a new business mode, which would allow end customers to subscribe to florists and have continuous supply of bouquets of roses. To make this business mode possible, we combine a quality-aware modeling technique with a distributed model predictive control strategy. This approach can optimally schedule the logistics activities in a typical cut rose supply chain based on roses' estimated vase life. We compare the proposed business mode with a currently used mode in simulation experiments. Results illustrate that the new business mode could reduce lost sales and spoilage in a cut rose supply chain. Reference: X. Lin, R.R. Negenborn, M.B. Duinkerken, G. Lodewijks. Reducing unmet demand and spoilage in cut rose logistics: Modeling and control of fast moving perishable goods. Accepted for publication in Transportation Research Record, January 2018.